Published: July 10, 2012 at 02:39 p.m. The Broward County Sheriff's Office in Florida was searching for the cousin of Chicago Bears wide receiver Devin Hester on Tuesday in connection with a fatal shooting that took place on the Fourth of July. Antoinne Robert Hester was wanted in connection with the shooting of Bevins Bennett. 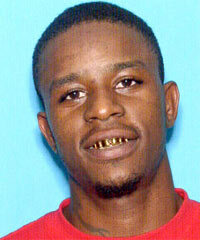 Hester, 22, is suspected of shooting Bennett while both of them were in an automobile together. Bennett died on Saturday. There were conflicting reports initially as to whether Antoinne was Devin Hester's brother, but NFL.com and NFL Network confirmed Tuesday that they are cousins. The Broward County Sheriff's Office confirmed separately to ESPNChicago that officials have been in contact with the family of Antoinne Hester, including Devin. The family has cooperated fully with the investigation.